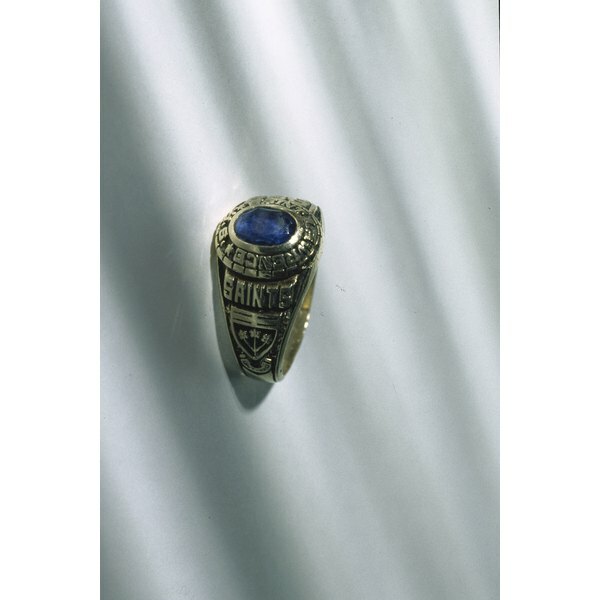 Jeweled rings mark important accomplishments such as graduation. Whether an engagement ring, wedding ring, class ring or championship ring, in Western culture rings can be markers of important transition points and serve as symbols of accomplishment and excellence. They also can be fun. For men, especially, having to know your ring size means something good and worth commemorating has happened or will happen soon. Fortunately, finding your ring size is quick and easy. Wind tape measure around the base of the finger you wish to size for a ring. Mark the spot where the tape measure begins to overlap itself -- the point where it forms a complete circle. Note the number of inches or millimeters where the mark is on the tape measure. Find this measurement on a ring size chart, such as the one at kingofgoldcaps.com/ringsize.html. The chart will tell you which ring size corresponds to your finger measurement. For example, if your finger is 2 1/4 inches in diameter, your ring size is 7.5. King of Gold Caps: What Size is Your Ring Finger? Derek M. Kwait has a Bachelor of Arts in English writing from the University of Pittsburgh and has been writing for most of his life in various capacities. He has worked as a staff writer and videographer for the "Jewish Chronicle of Pittsburgh" and also has training writing fiction, nonfiction, stage-plays and screenplays.